Schwartz & Wade, 9780399556760, 40pp. From the illustrator of the award-winning Sophie's Squash comes a rollicking read-aloud featuring a very tiny toad who gets displaced as animals--and humans--brush past him on the road. It's hard to be a tiny toad minding your own business on a twig. First a bird pecks at him. . . . Then a bee buzzes. . . . Then a dog barks . . . and so on. And each time the toad is surprised by a buzz or a woof (or the toe of a sneaker! ), he hops to a new location farther down the road. With fun sounds, clever rhymes, and an irresistible rhythm, this is the perfect story for sharing one-on-one or in a group. Peggy Archer is the author of Name that Dog: Puppy Poems from A to Z and From Dawn to Dreams: Poems for Busy Babies, among other books. 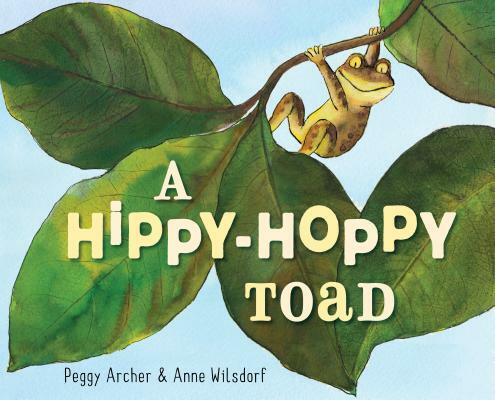 A Hippy-Hoppy Toad won the 2015 Society of Children's Book Writers and Illustrators Work-in-Progress Award. You can follow Peggy Archer on Twitter at @PeggyAArcher and visit her at peggyarcher.com.